Shared Governance Nurse Manager Training Program is the only training program targeted to nurse managers that is based entirely on the evidence in the literature and expert opinion. Designed to assist nurse managers in delivering a shared governance training program within their hospital, this book and its accompanying tools and resources provide straightforward, ongoing training. There is no “one size fits all” model for shared governance; each department must find the structure and process that work best. And while frontline management plays an essential role in the success or breakdown of shared governance, there is a lack of consistent instruction for management. 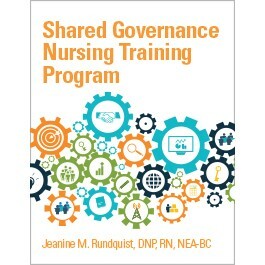 Author Jeanine M. Rundquist, DNP, RN, NEA-BC, helps you provide this training with case studies and downloadable tools, allowing you to give your shared governance program the time and attention it needs to thrive. Dr. Rundquist is the Director of Performance, Practice & Innovation / Magnet Program Director at Children’s Hospital Colorado. She has led four Magnet-designations at two organizations and has experience in designing and implementing systems to support the care delivery system and professional practice. Dr. Rundquist received her bachelor’s in nursing (BSN) degree in 1995 from North Dakota State University; her master’s in nursing (MSN) in 2002 from University of Phoenix and doctor of nursing practice (DNP) in 2014 from Regis University. Her doctoral work was focused on shared governance and the nurse manager role. Dr. Rundquist has served in a variety of leadership roles, including Magnet Program Director with focus on nursing quality/safety, nursing metrics, shared governance and professional practice.